It is no surprise that I’m a fan of dressing up for Disney. 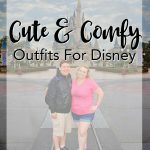 Earlier this year, I shared some of the fun Disney Outfits that I’ve made over the years. 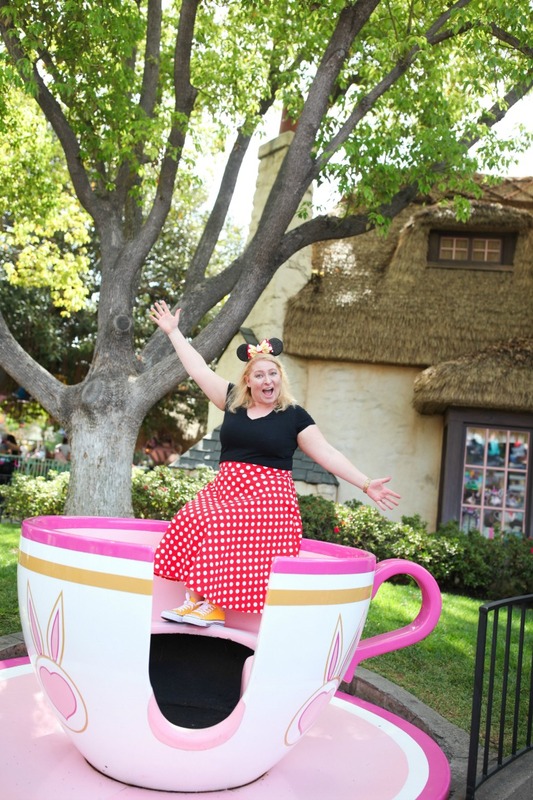 When some friends and I made plans for Disneyland at the beginning of May, I decided do find a Minnie Mouse outfit for the occasion. 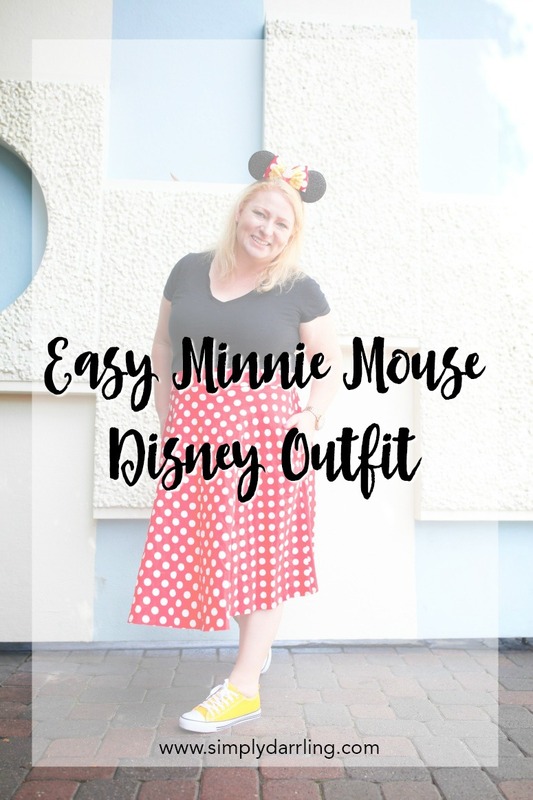 I always loved seeing fun skirts and dresses when I visited the parks, but wasn’t sure if it was something I would be comfortable in throughout the day. 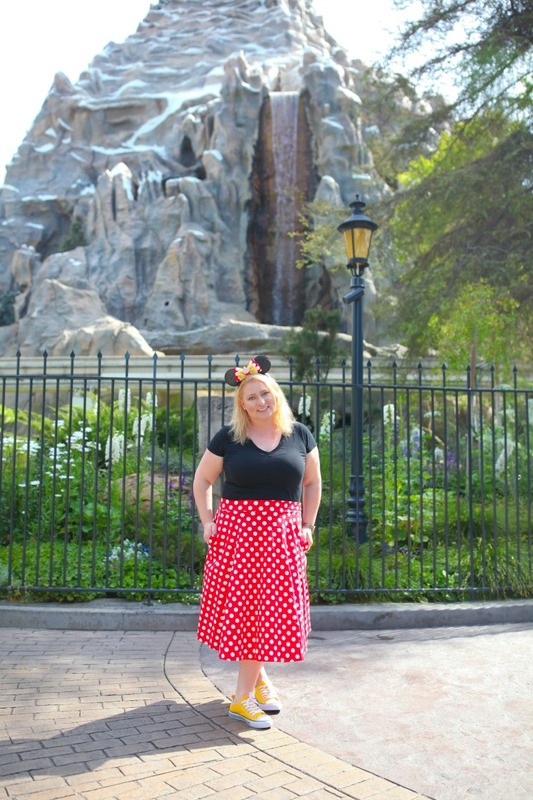 Keep reading to find out more about this outfit, and my thoughts on wearing skirts to the parks. Thanks to Annie Vovan Photography for all these amazing pictures! 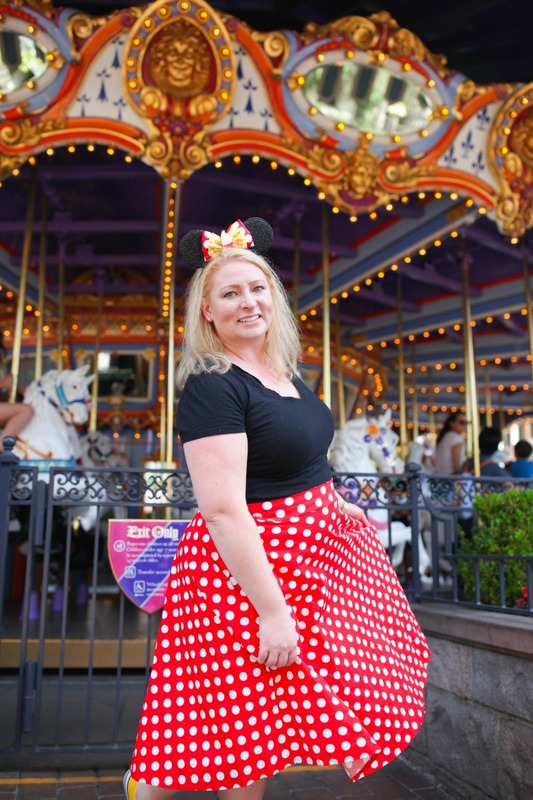 The Minnie Mouse outfit all focused around this awesome Red & White Polka Dot Skirt. I knew that I could use a basic black tee for the top (and I already had a few hanging in my closet). The shoes proved to be the hardest part. Apparently Converse had some bright yellow ones a couple years ago; however, I couldn’t find any in my size that could arrive to my house in time (because, did I mention that I was ordering this just a couple days before I left?). I ended up finding these Yellow Canvas Shoes which ended up working great. I love the pop of yellow along with the black and red. These only came in whole sizes; and some comments stated that they ran small so I went to a size 9 (I normally wear an 8-8.5). I probably could have worn an 8; but didn’t want to risk them being too small for the park. Of course no Disney outfit is complete without ears. For this Minnie Mouse outfit, I decided to pull out my Dole Whip Ears which tied in nicely with the red and yellow theme of the rest of the outfit. Having a backpack around Disney is essential. I have a handful of things that I always make sure to bring along (check out some ideas for your trip as well). 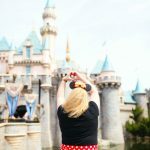 I bought a similar Kate Spade Backpack a couple years ago to be my camera travel bag, and it turned out to be a great lightweight backpack for Disneyland as well. 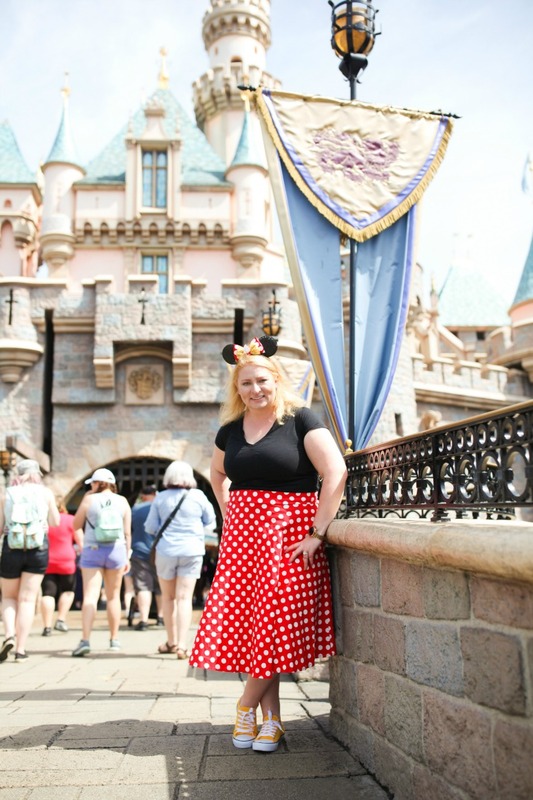 I had planned on making the skirt a bit shorter before I headed out to the parks, but considering it arrived the day before I flew out, I ran out of time. I think the length ended up adding to the charm of the outfit. The skirt also had POCKETS which is pretty much amazing. 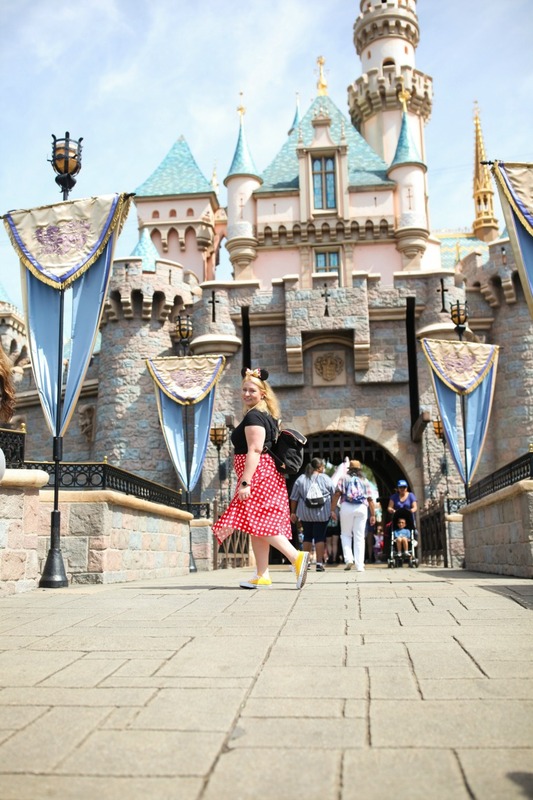 Overall, wearing a skirt to Disneyland wasn’t that inconvenient; however, I didn’t do too many rides while wearing it (I did bring a change of clothes for later in the day). 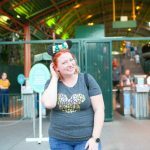 I would probably wear a skirt or dress to the parks again; although it is definitely more comfortable on the more mild weather days. 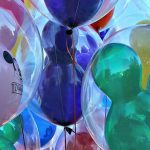 Next time you head to Disney, I hope you get a chance to wear some fun outfits to mark the occasion. It adds an additional level of magic to the day, and is so much fun. You know I love this Minnie bounding! Ahh so cute and simple! That outfit is so cute! I love it on you. This is super cute! 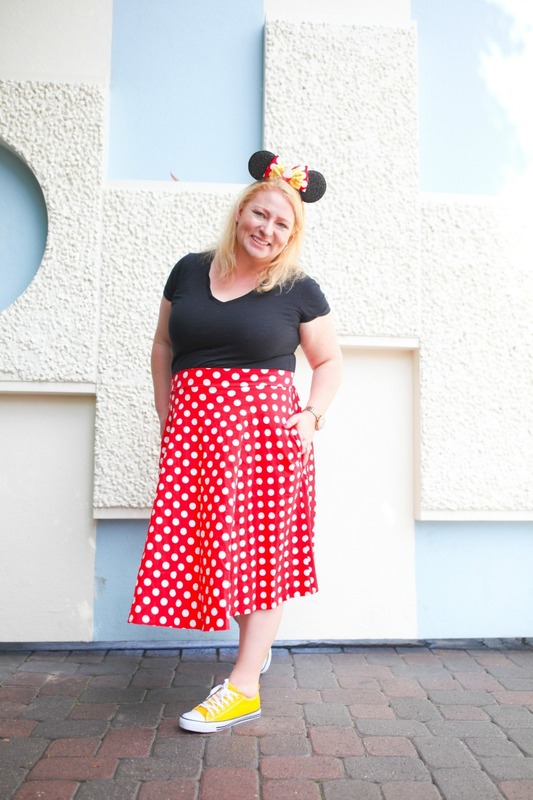 The perfect Minnie outfit!